I've blogged about secure portable hard drives in the past. Most of them have had some type of biometric authentication like a fingerprint scanner. This drive, called the exSECU ez850 has a different form of security. This one is especially handy if it is used by more than one individual, say a multiple doctor practice where the same person isn't always doing the backups. 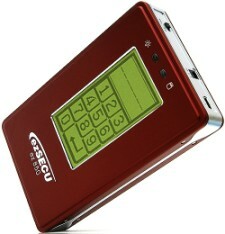 The drive enclosure has a touchscreen that allows input of a PIN that unlocks the drive's contents. It accepts SATA hard drives and supports USB 2.0 The PIN can be up to 12 digits. It also has a one button lock feature that will secure the drive in case you have it running and need to step away from your computer and don't want others to have access to the data on the drive. A pretty nifty idea. Since it's an enclosure and you can swap hard drives at will, you could use this with multiple inexpensive 2.5 inch SATA drives.